New York: George Braziller, Inc, 1983. 1st Edition. Hardcover. Fine. First edition of the large folio facsimile printing of the legendary 1947 edition, complete with twenty large color plates (including fifteen double-page). With Introduction by Riva Castleman, text translated in English by Sophie Hawkes. Published for the Museum of Modern Art. New York: George Braziller, Inc., 1983. Large folio (12x15.5 in; 30.5x39 cm), contents loose as issued in printed wraps; publisher's cloth-backed clamshell case; original board slipcase. A FINE COPY. George Braziller. As New. 1985. Paperback. 080761131X . *** FREE UPGRADE to Courier/Priority Shipping Upon Request *** - *** IN STOCK AND IMMEDIATELY AVAILABLE FOR SHIPMENT - AS NEW, THE TEXT BLOCK IS PRISTINE, CLEAN, UNMARKED, AND IN EXCELLENT CONDITION - - 146 pages. London: Thames & Hudson,, 2013. Folio. Sheets loose in original paper wrappers, as issued. With accompanying book mounted on the reverse of the box cover, as issued. Housed in the publisher's blue solander case, spine lettered in silver. With 20 colour plates. A fine copy. First edition thus, first impression. This facsimile folio of Matisse's late masterpiece, originally published in 1947, is accompanied by a book that contains two essays by Francesco Poli and Corrado Mingardi and a full translation of Matisse's text. "At the age of seventy-five, during a twelve-month confinement to his bed, Matisse composed Jazz. The title itself evolved from the affinity Matisse felt between his own method of improvisation and that of jazz musicians. Actually, most of the scenes of Jazz are taken from circus life and represent sword swallowers, knife throwers, cowboys and tank swimmers. Several of the performers existed in life, for instance Codomas and Monsieur Loyal, a famous clown. 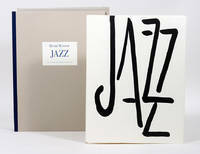 The illustrations for Jazz were not conceived as original prints. Instead, they are splendid colour reproductions of the signs Matisse worked out with scissors, paste and pins. The artist first covered large sheets of white paper with thin washes of brilliant colours [brilliantly rendered in this edition]. From these he cut out figures and forms which he then arranged with paste and pins into bold patterns. These collages of painted pieces of paper (Matisse called them 'drawings with scissors') were reproduced by pochoir (stencil) using the same colours Matisse himself had originally mixed" (Leymarie, Read, & Lieberman, Henri Matisse, 1966, pp. 28-29). George Braziller, 1983-10-01. Hardcover. Used:Good. Braziller, New York, 1983. Facsimile Edition. Fine Condition/No Dust Jacket. HENRI MATISSE. Jazz, New York: Braziller, Museum of Modern Art, 1983. Folio, a facsimile of copy No. 43 of the original Teriade edition, pp. xxvii, 154, 1 (colophon), loose leaves in clamshell box, color prints. With an English translation by Sophie Hawkes and an introduction giving the history of this book, which was first published in 1947 in an edition of 270. This facsimile is of a copy held by a Munich museum. MOMA created a small, partial facsimile edition for members in 1960. A few stains on box, all else fine. Size: Large Folio (bigger than A3). Text is in French. Text body is clean, and free from previous owner annotation, underlining and highlighting. Binding is tight, covers and spine fully intact. All edges clean, neat and free of foxing. Quantity Available: 1. Shipped Weight: 2-3 kilos. Category: Art & Design; France; French Language; Reference. Pictures of this item not already displayed here available upon request. Inventory No: 54182. .
Milano, 2012. 152 p., grande formato, nuovo. L'artista francese realizza quest'opera all'et&agrave; di 78 anni; afflitto da problemi di salute che lo costringono in carrozzina, Matisse non perde la sua instancabile curiosit&agrave; e, aiutato dai suoi assistenti, sperimenta un nuovo modo di dipingere: con dei ritagli di carta dai colori intensi e brillanti crea dei grandi collage raffigurando composizioni di carattere astratto. Questo modo di dipingere viene denominato 'papiers d&eacute;coup&eacute;s' o tecnica del 'dipingere con le forbici'. L'uso delle forbici infatti permette a Matisse di stancarsi meno che con tavolozza e pennello ma di ottenere comunque risultati sorprendenti per senso di equilibrio e purezza delle immagini. Per creare 'Jazz' Matisse trae ispirazione dai saltimbanchi, dal teatro, dalla musica e dalla mitologia; alcune tavole, come 'Icaro' o 'Il Mangiatore di spade', sono diventate vere e proprie icone dell'arte moderna. Questo capolavoro fu pubblicato nel 1947 da Editions T&eacute;riade con tiratura di soli 250 esemplari. Scranton, Pennsylvania, U.S.A.: George Braziller, 1983. A SECOND EDITION IN DJ. AND SLIPCASE. First edition thus. A facsimile of the 1947 original edition of 250 numbered/signed copies. With facsimile of the original colophon signed by Matisse. near Fine, in d.w.. Signed by Author(s). Hardcover. Near Fine/NEAR FINE. Book. 1983 . (Matisse, Henri). JAZZ by Henri Matisse. Braziller, NY, 1983 (3rd Pr). Folio, cloth, DJ, text and color facsimile's after the original edition of 1947. Fine, DJ is Very Good with a few tears at the top and bottom edges, but no chips or losses. NY: George Braziller, Inc, 1983. Matisse, Henri. First English edition, second printing. Replete with Matisse's fervent and vibrant artwork, presented according to the original order designed for the most exhilarating and evocative experience. With an Introduction by Riva Castleman and Matisse's text translated by Sophie Hawkes. Includes Matisse's table of images and a facsimile of the original 1947 edition's colophon. Bound in black cloth over boards with Matisse's monogram stamped in red at lower corner of upper board. Fine, in near fine pictorial dust wrapper and somewhat toned slipcase. New York: George Braziller. 1985. First Edition; First Printing. Hardcover. 080761131X . Near Fine in wraps. First Edition stated. ; From the estate of Ed and Kiki Brodkin. ; 8.4 X 5.9 X 0.7 inches; 146 pages; All domestic orders shipped protected in a Box. .
George Braziller. Collectible - Very Good. PLEASE NO INTERNATIONAL ORDERS FOR THIS LARGE BOOK. NY: George Braziller, 1983. 2nd printing of the facsimile edition. Hardcover. Folio. 146 pgs. Color plates. Text in French. Near fine in a very good dust jacket and near very good slipcase. Jacket is edgeworn and has a 1 inch tear to top front corner near spine. Blue cloth covered slipcase is edgeworn. Inquire if you need further information. 1985-06-04. New. Ships with Tracking Number! INTERNATIONAL WORLDWIDE Shipping available. Buy with confidence, excellent customer service! George Braziller. Hardcover. 0807610755 Like New Condition. . Fine. George Braziller. Hardcover. 0807610755 New Condition. . New. 2017-05-03. New. Ships with Tracking Number! INTERNATIONAL WORLDWIDE Shipping available. Buy with confidence, excellent customer service! 1992-05-07. New. Ships with Tracking Number! INTERNATIONAL WORLDWIDE Shipping available. Buy with confidence, excellent customer service! New York: George Braziller, Inc., 1983. Original black cloth with dramatic red and white titling with a little fading on upper and lower edges. Striking blue dust jacket with black, red and yellow cutouts and white script titling. There are a few small tears at edges of jacket and some rubbing on corners. The top and bottom edges have a thin line of ever-so-slight fade where the jacket did not cover. All the text components of this work on Matisse are pristine. Introduction by Riva Castleman, the text of Jazz translated by Sophie Hawkes. 20 breathtaking images by Matisse. Originally published by Verve in 1947.. First Edition. Cloth. Very Good/Good. Illus. by Author. Elephant Folio - over 15" - 23" tall. Facsimile. George Braziller Inc. Used - Very Good. Very Good condition. Very Good dust jacket. George Braziller Inc.. Hardcover. 0807600180 Brand new book.Buy with confidence. Money Back Guarantee.Expedite Shipping Available. International shipment available. . New. George Braziller. Hardcover. 0807610755 Ex-library book checked out 9 times....Like New Inside. Clean and crisp pages w/no markings! You will be pleased. Excellent book! Black sharpie on outside page edges and 1st page. ( z1s126D ) Some very minor shelf wear on mylar cover. ** Fast Shipping! ** . Fine. George Braziller, 1983. Book. Near Fine. Hardcover. 1st Edition. Folio - over 12 - 15" tall. top 1/2" corner of inside pages are lightly bumped not affecting plates, book is clean except for an inscription scotch taped to top of FFEP, dustjacket has a few closed tears,and light edgewear, second printing of first edition VG+ F in DJ . NY: George Braziller, second printing November 1983 ISBN 0-8076-1075-5 Folio (15.5 in. by 12.0 in. ); 146pp. ; very good hardcover; very good dust jacket; lightly torn, rubbed dust jacket edges; scraped front panel; lightly faded book edge; crisp; clean; bright..
George Braziller, 1983-10. Hardcover. Good. George Braziller. Used - Like New. Ships from Reno, NV. Book in almost Brand New condition. 100% Money Back Guarantee. Shipped to over one million happy customers. Your purchase benefits world literacy! George Braziller Inc.. Hardcover. 080761291X New Condition *** Right Off the Shelf | Ships within 2 Business Days ~~~ Customer Service Is Our Top Priority! - Thank you for LOOKING :-) . New. George Braziller. PAPERBACK. 080761131X New Condition. . New. George Braziller Inc.. Hardcover. 080761291X New Condition. . New. George Braziller Inc.. Hardcover. 0807600180 New Condition. . New. 1992-05-07. Good. Ships with Tracking Number! INTERNATIONAL WORLDWIDE Shipping available. May not contain Access Codes or Supplements. May be ex-library. Shipping & Handling by region. Buy with confidence, excellent customer service! New York: George Braziller, ., 1992. oblong 8vo. pp. xviii, .Text in French with English Translation & Introduction. many colour illus. bds. dw.. Hardcover. 2017-05-03. Good. Ships with Tracking Number! INTERNATIONAL WORLDWIDE Shipping available. May not contain Access Codes or Supplements. May be ex-library. Shipping & Handling by region. Buy with confidence, excellent customer service! George Braziller, 1985. Mint copy as issued in wraps. Soft Cover. New. 4to - over 9¾" - 12" tall. George Braziller, 1985. A dazzling combination of colour plates and reflective handwritten thoughts on the nature of art, this si the closest thing to an autobiography that Matisse ever created. It is a syncopated composition of pictures and text that Matisse felt was the visual equivalnet5 of Jazz music. It has been translated from the French by Sophie Hawkes. New in wraps. Paperback. New. 4to - over 9¾" - 12" tall. George Braziller Inc.. Hardcover. 0807600180 Like New Condition. . Fine. 1985-06-04. Good. Ships with Tracking Number! INTERNATIONAL WORLDWIDE Shipping available. May not contain Access Codes or Supplements. May be ex-library. Shipping & Handling by region. Buy with confidence, excellent customer service! George Braziller, 1994. hardback. very good condition in a very good dust jacket. George Braziller Inc.. Hardcover. 080761291X Like New Condition. . Fine. George Braziller. PAPERBACK. 080761131X Like New Condition. . Fine. George Braziller Inc.. Hardcover. 0807600180 Special order direct from the distributor . New. New York: George Braziller. Good paper copy illus. in B/W and 4/C . Good. Paper. 1985. New York: The Museum of Modern Art, 1960. Later printing. Hardcover. Good +. 8 x 5 in. Paper boards. Numerous color plates. Condition is GOOD+ ; mild wear, covers very clean but spine is starting to detach at top and bottom. Binding tight and text clean. Art. Stax. George Braziller Inc.. Hardcover. 0807600180 . New. George Braziller Inc.. Hardcover. 0807600180 Remainder mark . Fine. Museum of Modern Art. Collectible - Acceptable. Fair Book. 1960 edition. Spine torn. Inquire if you need further information. George Braziller. PAPERBACK. 080761131X Crisp pages and tight binding. Appears unread. Light shelf wear on cover. . Fine.